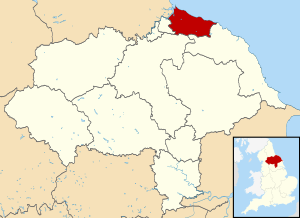 The borough of Redcar & Cleveland is a unitary authority area in the Tees Valley region of North Yorkshire in the North East of England, consisting of Redcar, Saltburn-by-the-Sea, Guisborough, and small towns such as Brotton, Eston, Skelton and Loftus. It had a resident population of 135,200 in 2011,. It is represented in Parliament by Anna Turley (Labour) for the Redcar constituency and by Tom Blenkinsop (also Labour) for the Middlesbrough South and East Cleveland constituency. 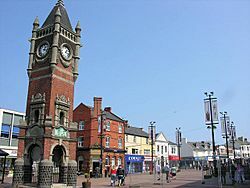 The borough borders Scarborough and Hambleton in North Yorkshire, and the unitary authority areas of Stockton-on-Tees, Middlesbrough and Hartlepool. Redcar and Cleveland Facts for Kids. Kiddle Encyclopedia.